If you love DC Universe animated films then Warner Bros. and DC Entertainment have got something special for you. 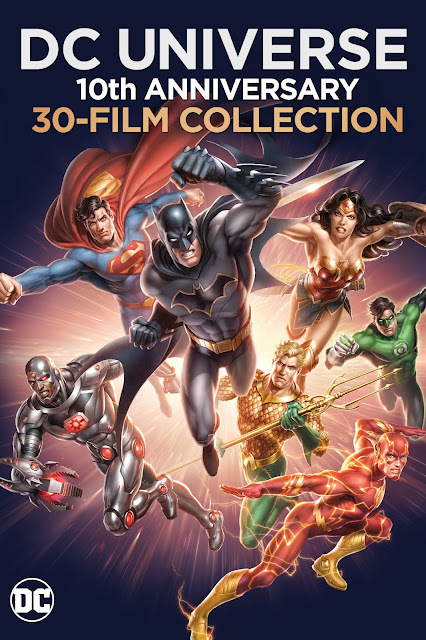 Today, they announced the release of the DC Universe Original Movies: 10th Anniversary Collection, a comprehensive box set of all 30 films, 5 animated shorts, new special features and exclusive collectible items coming this fall. The entire 30-film set will be available digitally on August 15, and in a Blu-ray box set on November 7. No pricing information has been released so far but more details are promised this summer. Animated Batman blu-ray DC Comics DC Entertainment DC Universe Original Movies: 10th Anniversary Collection DVD Justice League Superman Warner Bros.
Labels: Animated Batman blu-ray DC Comics DC Entertainment DC Universe Original Movies: 10th Anniversary Collection DVD Justice League Superman Warner Bros.